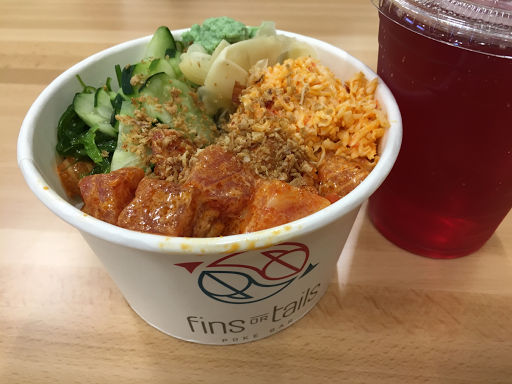 Dinner at Fins or Tails, a new poke (pronounced as in "hokey pokey") in the Sprouts shopping center on Huntington. I got a medium build-your-own poke bowl with raw tuna, spicy tuna, and salmon. The fish are mixed with a sauce and put on top of rice or noodles with some toppings. That was $9.99, and I got a pomegranate berry drink for $2.99. Very good!